Please refer to our stock # KG-35 when inquiring. Mayoke Yama Uba, Shinshuu (Nagano Prefecture.) Wood with bark intact, and straw rope. This folk toy depicts a Yama Uba (Mountain Hag) who is also called Yamamba in other parts of Japan. 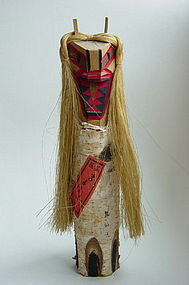 "Mayoke" means "amulet" or "charm," so the item is intended to ward off evil or bad luck, even though Yama Uba are often referred to in stories much like the bogey man is depicted in America. The Yama Uba does have a benevolent side as well, as a Yama Uba was said to be the mother of the legendary mountain boy hero, Kintaro.